I’ll admit it! I’ve bought McClothes before. I go out shopping and end up at Walmart or somewhere with a rack of cheap clothes and see some cute things that HAVE to have! I don’t try them on, I just get the size that seems to be my size. Who can pass up leggings for just a couple dollars. They are made in countries like China and India – I’m not sure why but I don’t seem to see Mexico on that list anymore. 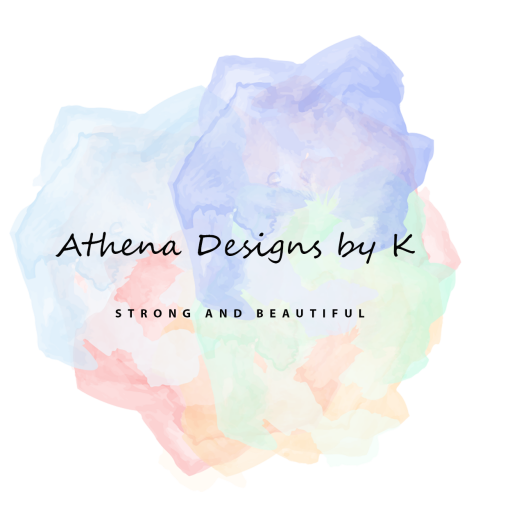 Sometimes I order them from online, companies like LTD, Zullily, and more specialize in cheap items. I’ve even gotten them from the coop groups where everyone has gone together to get clothes. They had $10 ruffle pants! What’s really happened with the clothes I get though is that they generally don’t fit well. Part of the issue is that the sizing is not for curvy women. I think for the ruffle pants from the coop I ordered 4XL and could barely get my leg in. I couldn’t and didn’t wear them in public even once. (It was a while ago and HA! I had ordered a few colors to try) Tops for me are tight around my arms and shoulders, I have even had issues with Tshirts. When the clothes had been wearable and fit they have ended up with ripped seams or even stretched funny after wash. They seem to always end up in the donate pile after an average of one wearing. If you assume a cost of $5 per item and the top and bottom included that’s $10. Going with 1 wear – that’s $10 per day that I wear the fast fashion outfits. I don’t wear them every day. I end up getting rid of a lot though without wearing them. I usually wear them when I have something going on and want to wear something new. My closet has a lot of staples that I wear normally. I’m bad though about getting food on my clothes, adding stains, accidently cutting through the leg of the pants… so in some cases fast cheap clothes are better for my wallet. Those fast fashion clothes are really made overseas by people that are being paid very little per hour. Check out Alibaba.com if you want to see how to get in a surplus of cheap clothes from overseas at almost no cost. Those factories don’t have the healthy work environment standards, the workers are throw away… that being said – those workers wouldn’t be able to eat without the influx of our money. Their households depend on those pennies a day they make from working in those factories. Then there is the question though of the moms like me that are here trying to make items. Our cost for supplies are higher, our time costs more…. and so our costs are higher. 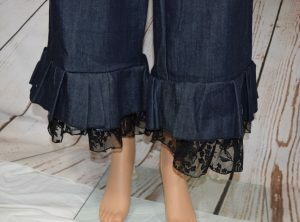 For a pair of ruffle pants to be made here in the US, the fabric alone is usually almost $20 at retail for a larger size (starting at $10 for a small capri with just one ruffle). Then you add in thread, elastic, electricity, packaging, taxes, book keeping, and oh my – you have already added in a few dollars. Then finally add in time. 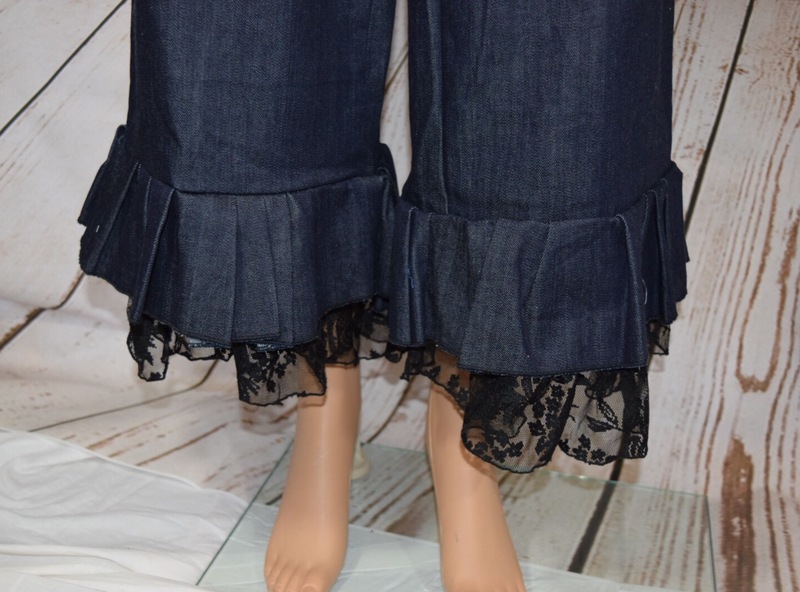 The quickest pair of ruffle pants takes about 45 minutes to an hour to make. Without topstitching and with less quality they could be made faster, but who wants to skip the quality… So what should they cost?